Here comes the sugar rush. You know how much fun it was for you to trick or treat and you want the kids to have the same kind of fun. Only now, you know that sugar is really bad for them. So how do you balance the fun with the responsibility of knowledge (without getting egged for giving out lectures for Halloween)? Here comes the sugar rush. You know how much fun it was for you to trick or treat and you want the kids to have the same kind of fun. Only now, you know that sugar is really bad for them and it isn't "just a treat" anymore. 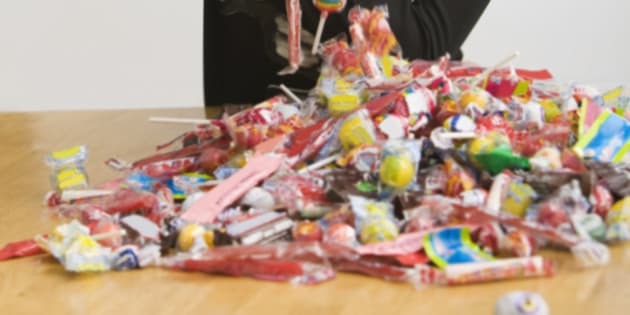 Kids these days live on sugar, they are getting an estimated five times more than they should and it causes all kinds of health issues from obesity, to fatty liver disease, to cavities. Not to mention the behaviour issues that any teacher will tell you comes barreling at them come next week's recess. So how do you balance the fun with the responsibility of knowledge (without getting egged for giving out lectures for Halloween)? Set up early and shell out mostly to the younger kids, close up when the older ones are just grabbing handfuls. Choose better quality food and less of it instead of the cheapest for the most kids. Avoid small candies and straight sugar. Studies show that the impact of sugar on the pancreas and brain are mitigated by whole grains and protein. I like these Nature's Path granola bars, or another organic choice that contains whole grains in the ingredient list. Think about going with a non-food item. The dollar store has all sorts of play doh, stickers and trinkets that keep the fun in the game but not the sugar. Remember that the message is as important and the treat and a subliminal visual like a toothbrush in the treat bag can go a long way. We have more opportunities to fatten ourselves up just around the corner. In less than a month we will be starting to celebrate the next set of holidays. Before you know it, there will be sweets swaps at the office and chocolate balls on every desk. Just like Sisyphus, our jobs will be the roll that rock up the hill knowing that we will never make it to the top. The secret is in the journey and enjoying it without letting it get the best of us.